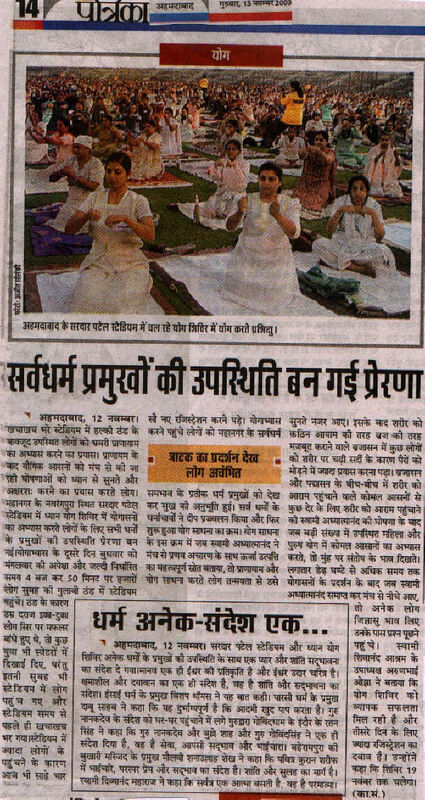 Pujya Swami Adhyatmanandaji had a week long spiritual tour to Northen India in first week of November. He had Satsangs at Ludhiana , Chandigarh and Panchkula (Haryana). Swamiji was invited for 80th Annual Vedanta Conference at Parmanand Bhandar where he gave discourses in the morning and enlightened the devotees. In the evening Swamiji Maharaj gave discourses on the subject of Bhaja Govindam (Moha Mudgara) to the devotees and members of B.H.E.L Yoga Mandal. Swamiji Maharaj was also invited to attend Roza Ifitkar where, while addressing, he emphasized the importance of Roza during Ramzan month and also the need to look within one own self and inspired them to be good and do good. Rev.Swamiji Maharaj also emphasized need to establish relationship with God and He will be there to protect you in time of need. “If we take one step to God, He moves ten steps towards us”. He concluded by saying Roza means yoga itself because it leads to Self-discipline and Self-discipline itself is yoga. 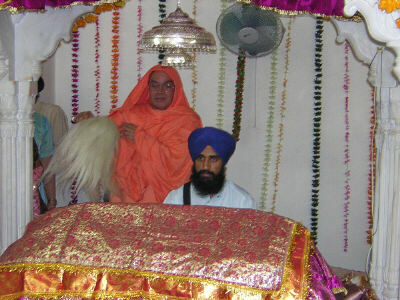 While returning, he visited some devotees in Delhi . 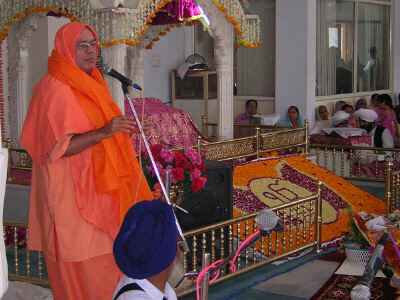 On his return to Ahmedabad on Nov 8, Pujya Swamiji paid visit to “Gurudwara Govinddham”. He paid floral tributes and respect to Guru Nanak Devji Maharaj and Holy Guru Granth Sahebji and addressed to devotees gathered there to celebrate Guru Nanak Jayanti. He spoke about the teachings of Guru Nanak Devji Maharaj in Punjabi, which was greatly applauded by devotees. Rev Swamiji joined the devotees in making rotis in the kitchen as he believes in “Kirat Karo Te, Vand Chhakhho”. He partook the prasad in Langar with devotees. “With regular practice of Yogasana, Pranayama and Meditation common people can enrich their lives and avoid many problems of life. Meditation is essential for mental peace and higher spiritual growth.” Said Rev. Sri Swami Adhyatmanandaji Maharaj in the press conference held November 8, 2003 at Municipal Corporation Central Committee Hall, Usmanpura before the start of Dhyan Yoga Shibir 606. He further elaborated the relevance of Yoga, Pranayama and Meditation to modern day living. 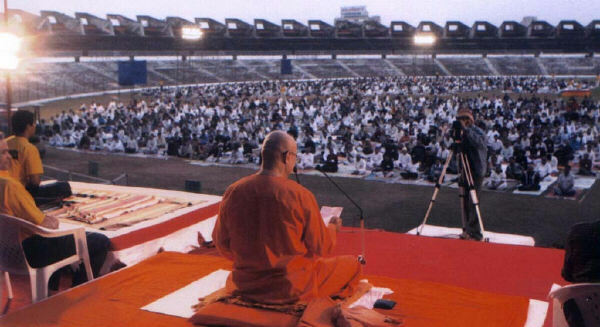 The Swasthya Shibir was organized at Sardar Vallabbhai Patel Stadium under the vibrant leadership of Pujya Swamiji in collaboration with Health Department of Govt. of Gujarat, Municipal Corporation of Ahmedabad and Ahmedabad Medical Association. It was attended by 6200 people in the early hours of dawn from 5.00 am to 7.00 am . 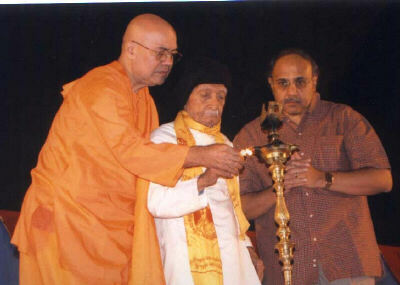 The Shibir was inaugurated by Spiritual Heads of Hindu temples, Parsi Agiary, Mosque, Church and Gurudvara. All the religious heads of various faiths spoke about amity and unity among the people of all communities and religions. 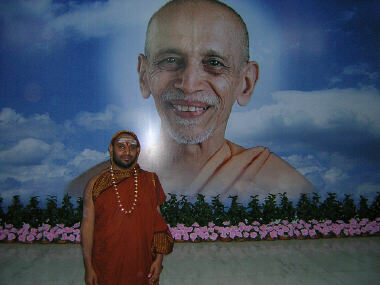 During the nine days Shibir Rev Swamiji introduced the simple Yogasana , Pranayams and Meditation technique, which would help to live happy, healthy and peaceful life, enhance general physical fitness and serve as an alternative therapy to various medical ailments. Simple Pranayama were taught also and explained the benefits of its. Regular Practice of Meditation is essential for mental peace and higher spiritual growth. Candle Light Meditation on the last day of the Shibir was the culmination of this unprecedented and unique experience that will be cherished by all attendees. During the Shibir group of doctors under the leadership of Dr. Mayurbhai Patel, a leading Dibetologist and Dr. Mrs. Inaben Patel provided the diabetic education to pateints, especially the young and old afflicted with Diabetes. They further stressed the importance of diet, exercise and medications for the prevention and treatment of Diabetes that is so essential part of managing diabetes. November 14, happened to be a World Diabetic Day. 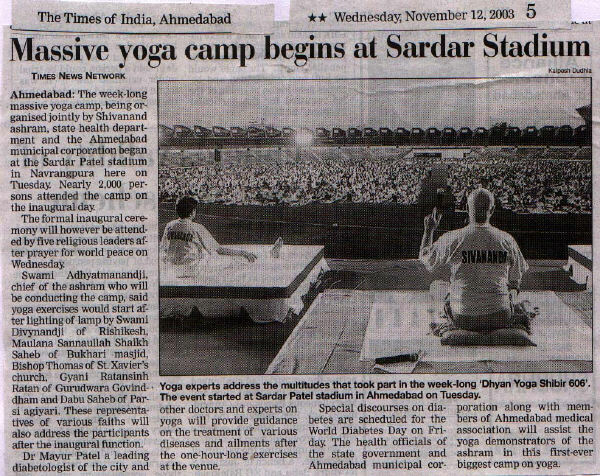 In the evening of Nov 16, 2003 Shibir, group of doctors made themselves available for answering heath -related problems and it followed by potluck dinner & garba at the Sardar Patel Stadium. 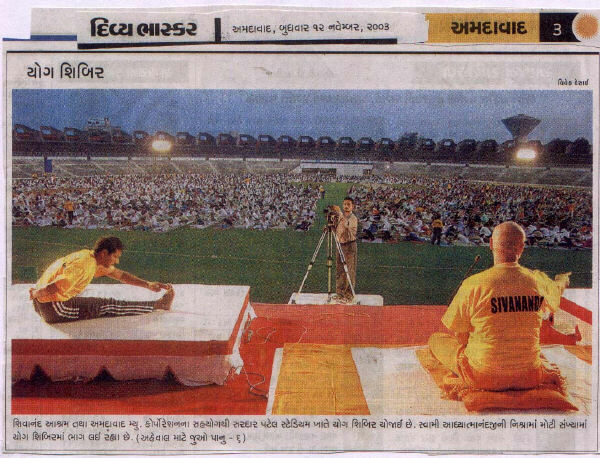 Extensive coverage by T V and News media of this unique and awe inspiring event was given, especially massive candle light meditation (the experience that will be cherish forever by all), in the city of Ahmedabad, Gujarat. 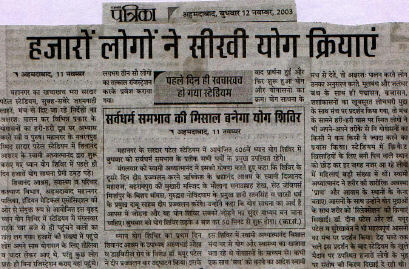 There was a request by all to have such Shibir again soon. 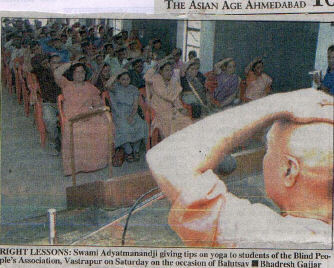 On Nov 30, 2003 evening a gathering of volunteers of Swasthya Shibir 606 was held at the ashram. Respected Health Secretary of Gujarat State, Shri. 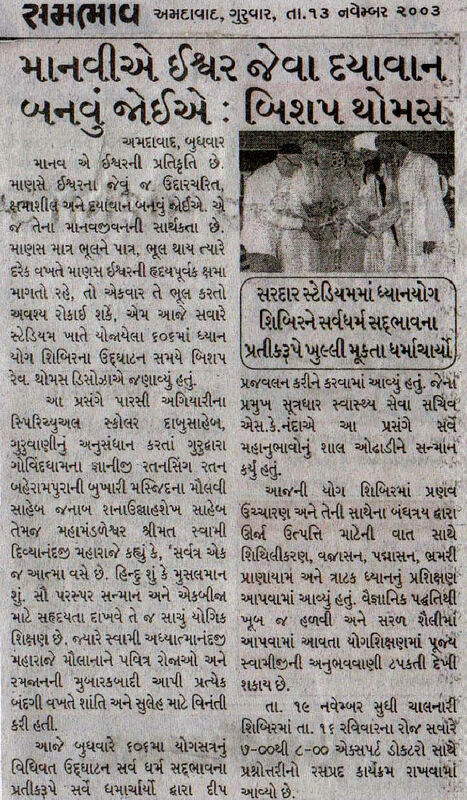 Nanda Sahebji, motivators of Shibir Dr. Mayurbhai Patel and Dr. Mrs. Inaben Patel of Ahmedabad Medical Association and representatives from Municipal Corporation and Sardar Patel Stadium also attended the function and efforts to make the event successful was appreciated. Sumptuous Dinner was served to all. Sri.Janardhanbhai Dave from Bhavnagar conducted the Devi Bhagwat Katha at Sri Sri Ashta Laxmi Bhavan. 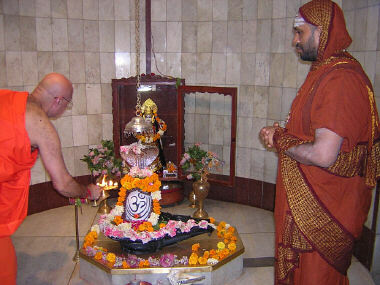 It was being attended by a large number of devotees. On Nov 22, 2003 , Sri Sri K.Parvathi Kumar, the Spiritual Guru of the World Teacher’s Trust along with his hundred and fifty devotees stayed at the Ashram for a day. 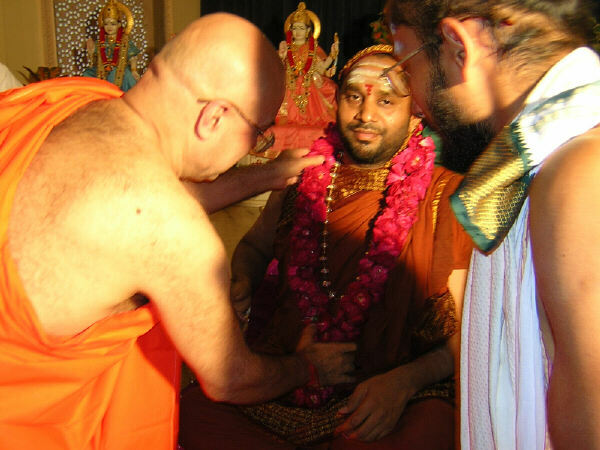 A ceremonial “Abhishekam” was performed at the Sant Kutir with traditional Vedic chants. 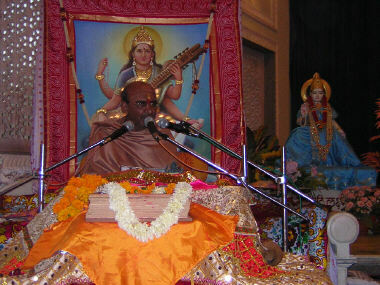 On Nov 23, 2003 the concluding day of Holy Devi Bhagwat Katha H.H.Sri Jagadguru Badari Shankaracharya of Shaktipuram Srividya Peetheeswara, Sri Vidyabhinava and Sri Sri Krishnanda Theertha Mahaswamigal graced the occasion and stressed importance of Devi Bhagawat. Rev.Shankaracharyaji Maharaj was given a befitting and traditional welcome by Rev.Swami Adhyatmanandaji during His visit to Holy Ashram. 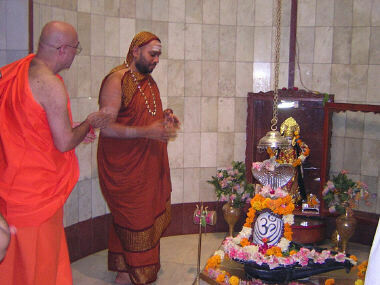 Sri Shankaracharyaji Maharaj visited Shri Vishwanath Mahadev temple, Shri Dukhbhanjan Hanuman temple, Sri Sri AshtaLaxmi Bhavan and Sri Sri Chidananda Dhyan Mandir. 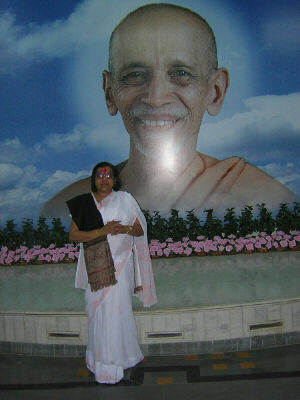 On Nov14, 2003 prominent Vaishnava Acharya Respected Indirabeti visited the Holy Ashram. A Satsang Sandhya was arranged. Smt.Monikaben Shah and Smt.Mayurikaben Oza sang devotional bhajans. On Nov 15, 2003 Rev. 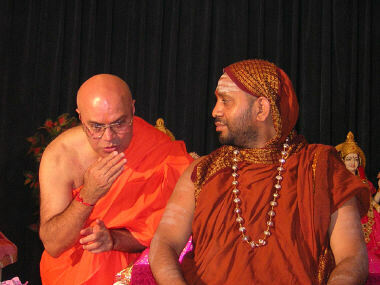 Swamiji Maharaj was invited to Blind Men’s Association where he addressed about 200 inmates and staff. On Nov 12, 2003 Rev. Swamiji gave a valedictory speech to graduating ladies who successfully completed Sewing Course, which is being conducted at the Sivananda Ashram. The certificates were awarded to all the students by visiting guest Smt. Vibha Sinha from Delhi . 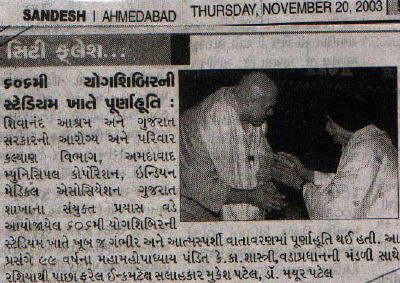 During midday of Nov16, 2003 Pujya Swamiji performed opening ceremony of “ Sushrusha Nurshing Home” established by a group surgeons of Vadodara under the leadership of renowned orthopedic surgeon Dr. G. V. Merchant. On Nov 24, 2003 , Rev. 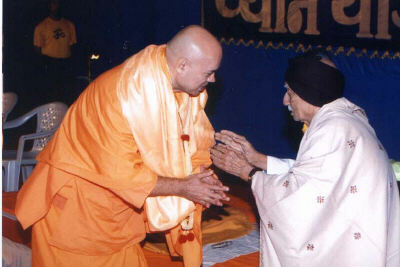 Swamiji was invited by Sadvichar Parivar. He delivered words of wisdom to aspirant trainees for the Defense Services. On Nov 25, 2003 , Rev. Swamiji along with Dada Swami Shankarananda Maharaj and a few devotees had a quick trip to Dhangadhra, Morbi, Adipur and Bhuj, where he addressed the meetings at Rotary Club and a school. Satsangs were arranged at the residence of devotees. During his stay at Adipur, Swamiji maharaj visited Sivananda Hospital and blessed the sick patients.